3Dice is unusual in that they are one of the few casinos out there to use their own software. 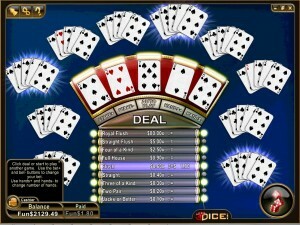 This is both their greatest strength and their greatest weakness: when you play at 3Dice you get to play games that you will not find anywhere else but you do not get the same breadth and depth that you will find at either online casinos that use one of the big software providers or who use a variety of different providers to service their casino. They are a download only casino and do not yet offer any mobile gaming options. They are also one of the few casinos that are USA player friendly. The first five minutes I spent looking at the casino left me with a feeling of “is this it?”. I had heard great reports of this casino but when I got there the first thing I noticed was the small number of slot games and the general lack of depth of their games offering. None of the themes for the slot games grabbed me and it was with some reluctance that I actually opted for some of the slot games to give the casino a try. After a few more minutes though I got a real feeling that the software they use had been clearly designed by or with significant input from people who love online gaming. The graphics are excellent and the software design is full of nice touches that you start to appreciate as you play the games. It is not flashy perhaps but it is oozing in quality and provides a very rewarding and enjoyable experience. The multi-hand video poker shows all the hands, like actual spread out poker hands rather than the usual line of cards and this is just one example of creative thought and attention to detail that is transparent across all elements of 3Dice. All of the slot games I tried were full of great touches including well thought out bonus games, creative use of graphics and animation and some interesting innovations. This casino is like a classic film, not full of hype, spin or explosions but constantly rewarding the discerning player. The casino does have a few interesting elements to it that are worth highlighting. On their website they show what the payouts have been for the last few days which is a great little addition in my view both for people tracking streakiness of casinos and also for transparency in terms of payout rates. They also have a chat feature which enables you to connect with other gamblers whilst you are playing. 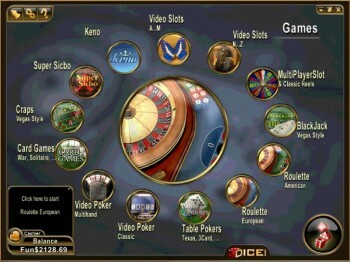 Interactivity is also increased by some multiplayer slot games. To be honest the interactive features have no interest to me but they may appeal to some other people and for some they may in fact be this casinos biggest selling point. I like the transparency when it comes to payouts which few casinos really excel in. An area of strength and surprising depth is their video poker games. This is an area where many major sites and software platforms leave the video poker fan a little short changed with some casinos offering vary few variations and sometimes very limited multi-hand options (I find single hand video poker a bit dull). I really like the graphics and layout that they use in these games as I have mentioned earlier but they also offer about 36 different video poker games all with single and multi-hand versions where you can play up to 100 hands at a time. This is in stark contrast to Blackjack which they only have one single hand version. They also offer both European and American Roulette, various card games including Casino War, four variants of table poker, craps, Sicbo and Keno. When you are looking at 100 different sites at least where you can play the same Microgaming games bonus terms are often an important factor in choosing which site to play on but with 3Dice it is not really the same. 3Dice offers something that is unique and cannot really be accessed anywhere else. They offer a range of bonuses including comp points, initial deposit bonus, high roller bonuses and free entry into some casino tournaments. At time of writing their main deposit bonus is 110% with a 30 times deposit and bonus playthrough although you also get some free comp points and free entry into a casino tournament as well. In short a reasonably good and fair sign up bonus but not amazing. They also offer on-going bonuses and incentives to keep you playing at their casino. In terms of customer service 3Dice consistently win awards for being one of the very best in the business in terms of customer service and providing players with a first class experience. They offer live support both on the phone and through live chat and have an excellent reputation of treating players fairly and supporting them with their issues. 3Dice is also one of the few options USA players have to gamble online. 3Dice is a great casino to try out. If you love video poker then I do not think there is another site out there that offers as good a video poker experience as they do. If you love slots then their games are of a high enough standard and sufficiently different, interesting and rewarding that they are well worth seeking out. The slot games do not draw on recent films or quiz shows for their themes but once you get into the games they provide a first class experience full of nice touches and innovation. I found the lack of variety in Blackjack, slots and some other games a little limiting so I definitely would not want to have this as the only casino that I ever played with but they are an excellent addition to the online gaming market and if you do not check them out you are definitely missing out on a great gaming experience.